In the article we have characterized the pyramid schemes from a moral point of view; highlights the signs of pyramid schemes; analyzed their impact on the lives of citizens and the risk to which investors are exposed; emphasizes the need to be careful with such organizations and forming a critical attitude to the “easy money”. • lack of office and official registration and more. Is there a little bit morality? I believe that answer is obvious – morality and pyramid schemes are things іs totally not compatible. Pyramid schemes is outright fraud and deception. In my opinion, the top of pyramid schemes commit the real evil and unfortunately, it is very difficult to eradicate, their feeding below – depositors, and while they exist, so long will exist pyramid schemes. Unfortunately, law enforcement authorities is quite difficult completely to follow appearance and the existence of pyramid schemes because recently many owners carefully conceal their appearance or disguised as other enterprises. Modern masking of pyramid schemes: “elite club”, “propose to earn,” “work for housewives, women in a maternity leave, students and pensioners”, “earn money without leaving home”, “work on the Internet”, “earnings for selected” etc. Nowadays, the phenomenon of “pyramid schemes” is not new; and there are many stories about that as these organizations openly “throw people”, this topic is actively discussed in different directions of the media. 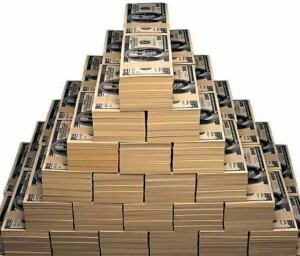 All over the world emphasizes the illegality and immorality of pyramid schemes:, they are banned in Ukraine and many other countries: Sweden, Turkey, Australia, Austria, Switzerland, Norway, New Zealand, Mexico, Nepal, Estonia, Japan, Portugal, Poland, Romania, China, Canada, USA, Spain, Italy, Denmark and others. And it would seem that nobody would risk to contact them … And people will still looking for “easy money” and still exposed to advertising organizations that are the the real pyramid schemes. And even the one who got burned once already on this, could still be at risk again. Unfortunately today despite all the above, pyramid schemes actively thrive and spoil the lives of ordinary citizens. Should also be noted that these organizations owned great suggestion and manipulation methods and actively use them in their advertising, and people did not even suspect. And even those who all his life trying to be cautious and wary of pyramid schemes, too, can “ensnare” because so attracted by the opportunity to make money and not to exert extra effort. In order not to fall into the trap of financial pyramids, you need to understand that easy money does not exist and beware of organizations that offer them; also keep away of companies that have at least some signs of financial pyramids, and of course, is to protect from them other people. Today is a very important a critical attitude to the “easy money” and the metaphor of “Free cheese is only in a mousetrap” has become outstanding relevance in the modern world. This is especially important in order to survive in contemporary world. If humanity will cease to take such organizations with their contributions pyramid schemes will cease to exist and this is the first but very important step in improving our world and fight against evil. This entry was posted in Social and tagged contribution, easy money, immorality, moral, morality, pyramid schemes, risk, the investor on 18/08/2017 by Mary. Ꮲretty! This has been an extremely wonderful post. Thanks for providіng theѕe details.